Owning a farm, expanding his business, helping other farmers and creating job opportunities are Thoko Mavimbela’s plans for the next five years. This 46-year-old farmer believes that using your hands and your brains is all you need to make a success. I farm with maize and dry beans on 6 ha arable lands at Oshoek in the Gert Sibande District in Mpumalanga. This year I planted only 1 ha because I was afraid that we might have drought like last year. I also farm with broilers, where I buy one day old chicks, rear them and sell the chickens after eight weeks. I also sell some cooked chicken meat. I own a catering business at the Oshoek border gate at Swaziland, where I cook food and sell it to the people who are working there as well as to those crossing the border on a daily basis. I grew up on a farm at Paul Pietersburg where my parents farmed with maize, beans, potatoes and some vegetables My father owned ±260 goats and I was their shepherd. He also owned more than 140 cows and 300 sheep and I was also the sheep shearer. I was thus motivated to farm with broilers and maize. Strengths: I buy one day old chicks and rear them using the maize which I harvest from my arable lands. I take this maize and mix it with other grains to feed those broilers. With my catering business I usually order between 200 and 300 one day old chicks, feed them for eight weeks and then sell them at R75 per chicken. I also cook the chicken meat and sell it at my catering business – I make between R200 and R240 per chicken. I also exchange the maize that I have planted for mealie meal to make porridge, which I also sell. I make ± R9 000 profit after paying all the expenses every month. Currently I own 28 cows, 40 goats and 70 chickens. Weaknesses: Our soils were very acidic before which resulted in a very low yield. Before we joined Grain SA we used to yield between 20 and 30 bags/ha. After joining Grain SA in 2007 we gradually improved and now we yield more than 100 bags/ha. With beans we were yielding between 10 and 15 bags/ha and now we are yielding between 1,5 t/ha and 2 t/ha. I think what contributed to my success is the training that I received from Grain SA on farming with maize and other grains in a more professional and productive manner. I also attended other courses organised by DARDLEA as well as other organisations. 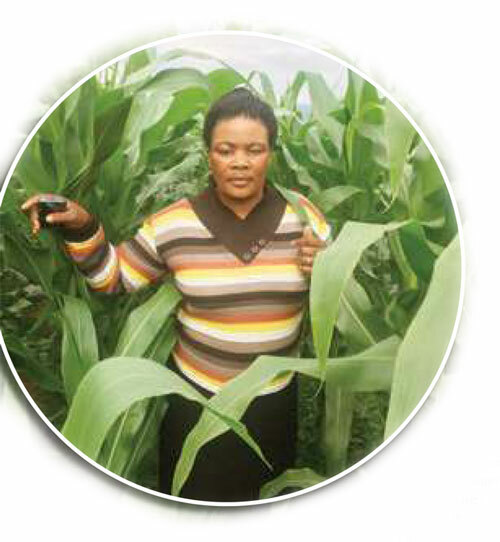 I have completed the Introduction to Maize Production offered by Grain SA; the Farm Business Management Level 1 offered by DARDLEA; the Occupation Health and Safe Environment offered by Grain SA; the Seedling Production offered by DARDLEA; and the Cultivation Training Course offered by DARDLEA. I would like to be trained in Farm Management, Human Resource Management as well as Maintenance of Farm Machinery. In five years’ time I would like to own a farm where I can farm with both livestock and grain. I also want to expand my business by acquiring more land so that I can plant grain on a big scale. To build my own abattoir is also part of my five-year plan – this way I can help other smallholder farmers so that they can also develop and I will thus be creating job opportunities for the unemployed. My advice to the young aspiring farmers is that the soil is a company which won’t be closed. The soil will always be there to be used to produce crops as long as you use your brain and your hands to work on it. It is good to have your own business and work for yourself unlike working for somebody else who will one day kick you out. Before you start any farming business make sure there is a market for your product. Article submitted by Jerry Mthombothi, Development Co-ordinator of the Grain SA Farmer Development Programme, Mpumalanga. For more information, send an email to jerry@grainsa.co.za.